Adam and I live in a charming pre-war building in New York City. Besides the moldings and the proper foyer, my favorite feature is our mail chute. A clear shaft runs from the top floor of the building straight to the lobby where a letter box awaits. Envelopes have been known to get stuck in between floors, so I avoid the chute when it comes to very important correspondence (bills, checks, etc.). But our post man empties the letter box daily! A little bit of mail chute trivia: the McGraw-Hill Building had a mail chute which often became congested (the building has 50 floors). Cinder blocks had to be removed to dislodge more than 40,000 pieces of mail. The rescued envelopes filled 23 postal sacks. Needless to say, the mail chute was shuttered shortly after the recovery efforts. P.S. 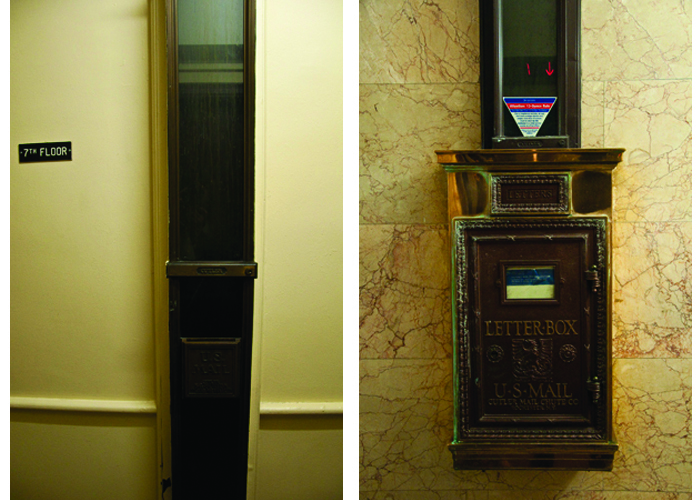 The 102-story Empire State Building still has four functioning mail chutes!